Grad Studies in Computer Science: Things to Think About - A presentation I have done once or twice a year that people are usually asking for details about. This is out of date in terms of details, since I haven't been grad chair in awhile, but most of the information is still relevant. Check out John's Tips for Comp. Sci. Courses (and they're good for courses other than mine too!). For the Fall term of 2013, I am teaching COMP 3190, Introduction to Artificial Intelligence. If you're looking for information about the Multi-Agent Systems Graduate Course that I offer semi-regularly, this year is not the year for it, but I'd be happy to talk to you individually about your interest. In general, I tend to teach a range of courses, from introductory and 2nd year software courses, to more specialized courses in artificial intelligence, programming languages, and occasionally systems courses such as Operating Systems. Please contact me if you wish any information about these courses or if you have questions regarding graduate studies in my area. Please see the disclaimer on our Lab webpage regarding graduate student inquiries. I have scheduled consulting ours and can be available outside of that. Since I'm the Head of Computer Science, I have to spend a great deal of time in the CS general office - if I'm not in my regular office, that's often where you will find me. If I'm in the head's office I may or may not be able to see you immediately, depending on what's going on at that moment, but you are certainly welcome to approach me there. I may also be in my lab in (E2-504). Directions for locating these places can be found here. My office schedule is below. 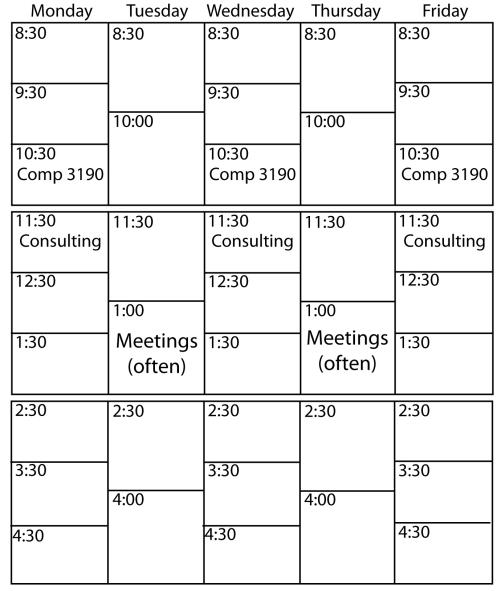 Consulting hours may change in case of committee meetings, but consulting times can also be arranged outside of this schedule as well (or, swing by and take your chances on me being in my office and able to see you). I can be reached by telephone at (204) 474 8839; this number has voice mail attached to it and messages are sent to me via email so I do tend to get them quickly. Email is almost always the quickest way to get in touch with me, though. If you want to use secure mail, my PGP public key is here. One of the things that Jacky and I are both interested in is improving the nature of how we teach artificial intelligence and related areas, as well as how we can improve computer science teaching in general. To that end, we've published a few papers on using RoboCup soccer to teach students about AI, real-time systems, and software engineering, and on using robotics to teach computer science principles to young people. Those papers are available on the lab website. An Economist article on the relative economic value of getting a Ph.D. Contents ©1993-2034 John Eric Anderson, unless otherwise noted. This page has been out of date since Wednesday, 04-Sep-2013 12:57:48 CDT.